Back to all of you requesting Keto. I totally get it- I have tried Keto before (I know, I kind of didn’t share that with you guys.) Last summer when I felt like my auto-immune symptoms were really flared up, I was looking for some relief, and my brother encouraged me to try it. Honestly, it was amazing. I spent 6 weeks on it, really strictly. And while I actually did not see a big change in weight, that was not why I did it- it was mostly out of curiosity about how it would make me feel. While it has been about 10 months since I did this experiment, I can still remember how profound the differences in sleep, digestion and energy were for me. Also SKIN!!!! My skin was the best it’s ever been, hand down. However, Keto can feel seriously restrictive and ultimately I broke. But honestly, I still favor eating low-carb as often as I can, because for me it really effects the way that my body functions. In fact, I am in the midst of a really bad arthritis flare up, so I have been considering trying keto for the treatment of this (has anyone experimented with it??) and have been cooking lots of Keto dishes for the family. I had to share this particular recipe because it is so delicious and easy and I feel like it is awesome for dinner or meal prep for the week. Even if the family ate half of it or 2/3 of it in a sitting, that usually will still leave a bunch of extra meatballs for taking to work for lunch- YUM. I also think that the cauliflower rice and zippy fresh sauce help brighten things up for the “meat fatigue” that Keto can bring on sometimes. Hope you try and enjoy this recipe! In the bowl of a food processor, combine the bacon, onion, garlic, Worcestershire, red pepper and salt and puree until somewhat smooth and well combined. It will be a wet pulpy mixture. In a large bowl, add the pork, beef, oregano, parsley and flour and then add the content of the food processor to the bowl. With clean hands, combine everything really well and then form the meat mixture into 12 large, evenly sized meatballs. In a large oven friendly pan or skillet, melt the coconut oil over medium-high heat. Add the meatballs and fry until golden brown on all sides (the best you can), about 3-5 minutes total. 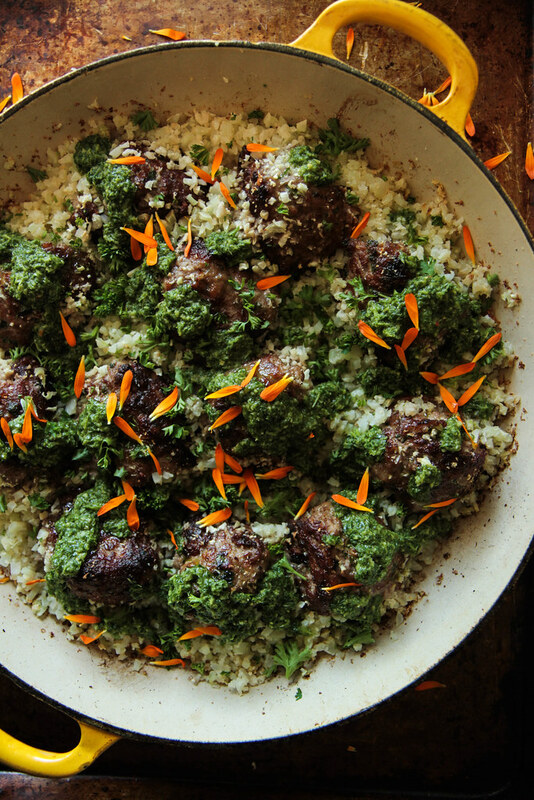 Add the cauliflower rice, pouring it in around the meatballs and gently shoving into the cracks between them. Place the whole pan in the oven and bake for 10 minutes. While the pan is in the oven roasting, make the Easy Chimichurri sauce. In the bowl of a clean food processor, pulse the garlic cloves until minced. Add the parsley, oregano, and spices and pulse until the herbs are broken down. Add the vinegar, lemon juice and zest and then turn the processor on and stream in the olive oil. When everything is well combined and you have a thick sauce, season to taste with kosher salt. Optional addition is the smoked paprika, which I would pulse in at the very end. 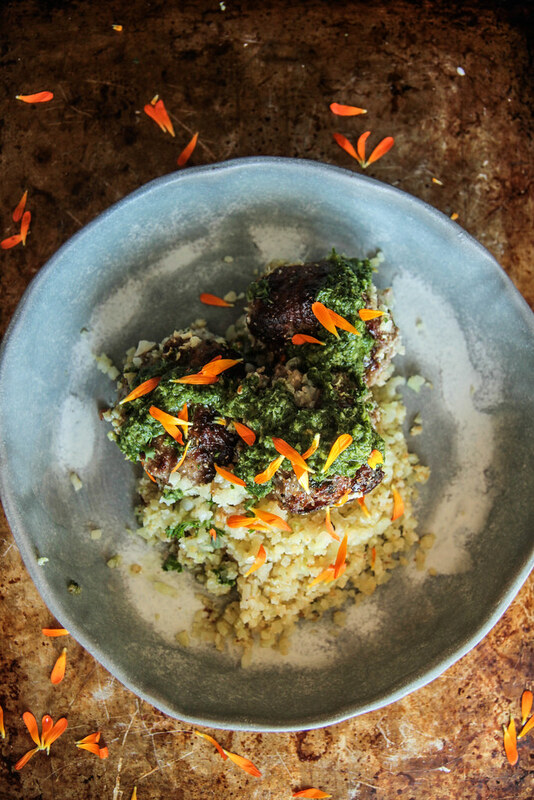 Remove the pan from the oven and using a spoon, gently push the cauliflower rice into the cracks around the meatballs, where it will absorb the juices. 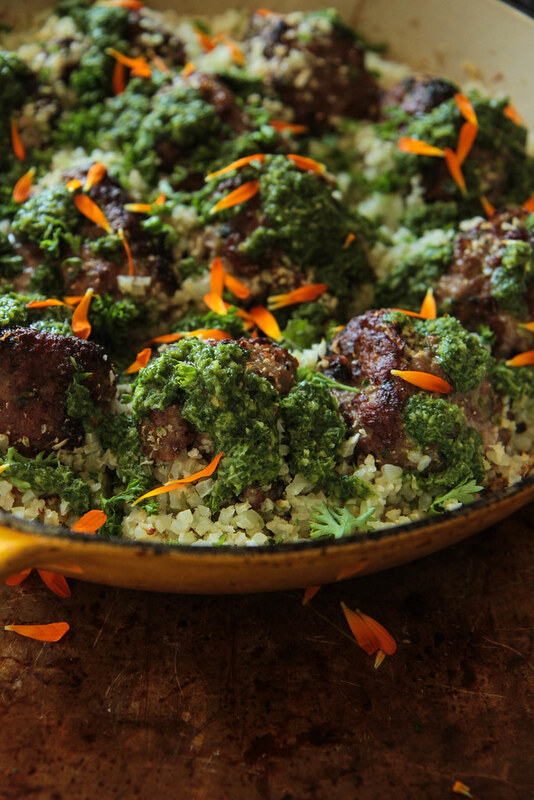 Sprinkle with the parsley and then drizzle with the Easy Chimichurri Sauce and serve immediately. Do U make your dried edible flower mix & how long does it stay good. How do U store it ? Hi Karina! I usually use fresh edible flowers and I just use the blossoms fresh from the garden or I store the blooms in a damp paper towel in the refrigerator for a day or two. You could also keep them fresh in a little bud vase on the stem and then just use as needed. Hi Heather, I’m 73 years old. My doc wanted to increase meds that I take and not wanting to do that I started Keto in January. I do check blood sugar levels and have gone from 105ish to mostly 75-85. My joint pain has decreased significantly to the point of not needing a cortisone shot that had been scheduled! A really nice side note is the loss of 18 pounds. I do have a vodka several times a week and berries occasionally and so far my sugar addiction seems to have subsided. I think this is something I can live with for health reasons and hope that you will continue to create more recipes. Please include the macros in the future. Hi Ruth- thank you so much for sharing, I love to hear how well this program has worked for you! I don’t usually do the nutritional info for my recipes, but I will tell you this worked out to about 2grams of carbs for each meatball. I did not do the cauliflower and sauce, but those are definitely low. I have lots more keto coming your way!